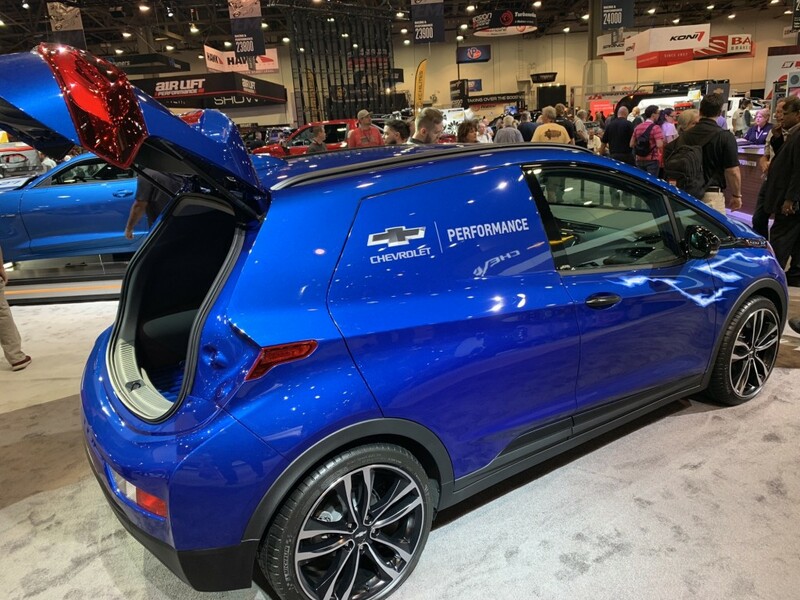 The 2019 Chevrolet Bolt EV has been reimagined by Chevy as a race support vehicle to serve “racing enthusiasts of the future,” as GM’s bowtie brand today unveiled the 2019 Chevrolet Bolt EV Panel Race Support concept at the 2018 SEMA Show in Las Vegas. 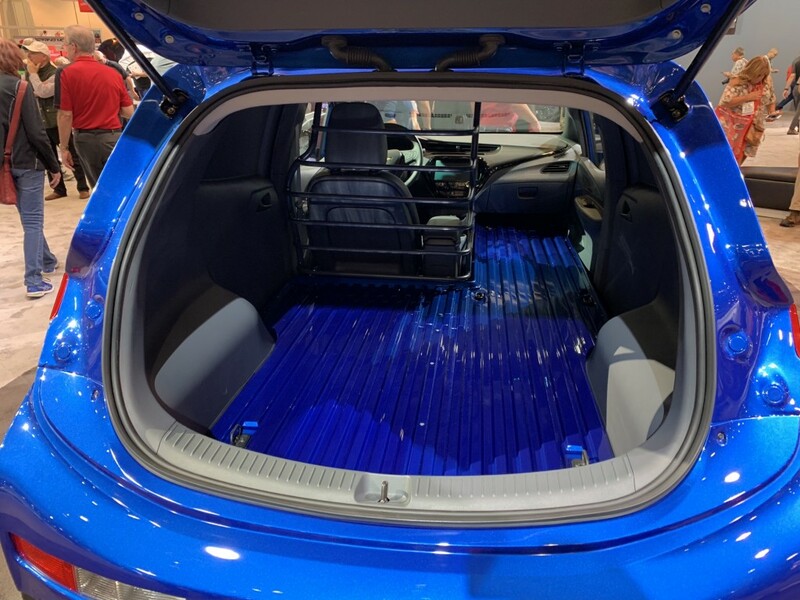 Based on a production pure-electric Chevy Bolt EV in Kinetic Blue Metallic, the Panel Race Support concept boasts a small range of official Chevrolet accessories and custom modifications handpicked for the car’s newfound duties as a racing support car. From the Chevrolet accessories catalog, there’s an illuminated charge port by AeroVironment ($325), black front and rear Chevy bowtie emblems ($115), a wall-mounted 240V/32A EV charging unit ($499), a pair of door sill plates ($75), and on the drivers side, a black all-weather floor mat with Bolt EV script ($140 each). All that adds up to a little more than a grand in accessories, although those add-ons really only tell part of the story. 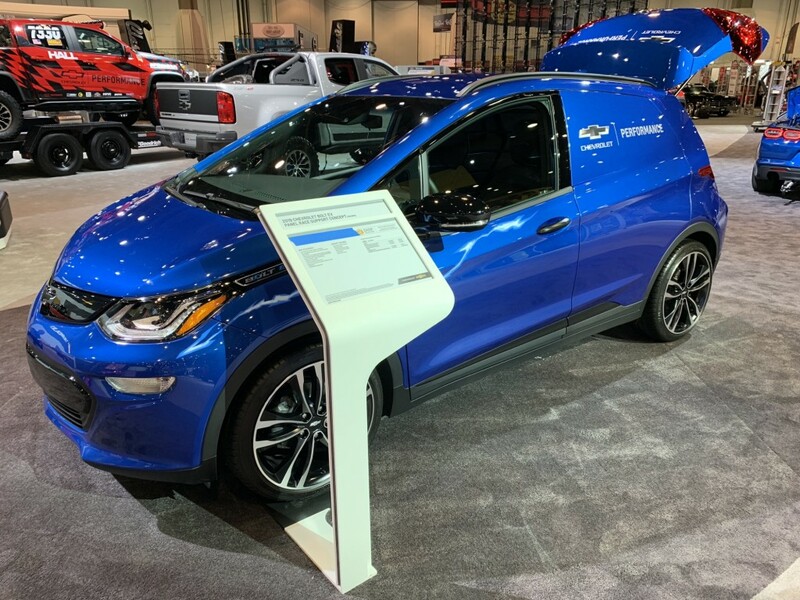 The real meat of the story is told by a range of unpriced modifications that aren’t in the Chevrolet catalog, like the side panels that block out the rear side windows on the Chevy Bolt EV Panel Race Support concept, effectively transforming it into a panel van. Those panels wear unique Chevy Bolt EV and Chevrolet Performance vinyl graphics, while the battery-electric hatchback rolls on special 19-inch alloy wheels and features a smattering of blue interior accents. And then, there’s the very thing that makes this Panel Support concept a racing support vehicle; it’s carrying a spare electric motor for the eCOPO Camaro – a 750-horsepower battery-electric drag racing Camaro concept also unveiled at the 2018 SEMA Show. The 2019 Chevy Bolt EV Panel Race Support concept demonstrates what’s possible with a hobby, a bit of imagination, and some money for modifications. It’s the perfect companion to the eCOPO Camaro electric drag racing machine, and together, the two cars might just give us an idea of what to expect from automobile racing in the not-too-distant future as we attempt to curb consumer greenhouse gas emissions. For the very latest GM-related SEMA news, stay tuned to GMAuthority.com. Love it. What a great little urban delivery vehicle that would make…pizzas, flowers, auto parts, etc. They should definitely offer a rear door delete option alongside the existing rear seat delete option. A slide-out tray on casters for delivery items would be really cool, too. Market the heck out of it to local delivery companies. No more trips to the gas station! Just plug it in overnight. They’d probably be able to sell quite a few—probably more than the rebranded Nissan vans they just discontinued.